Toronto's chief planner, Jennifer Keesmat, thought it was a great idea. "This is an idea that would actually work in this location in part because it's an area where there are vastly more pedestrians than cars," said Keesmat. I don't want to pick on Valenzona, who I'm sure is a smart, young man with a bright future in planning and picked some pleasing elements for his design here. No, my problem is that Valenzona's design is representative of a growing planning movement that could be considered quasi-"shared space". 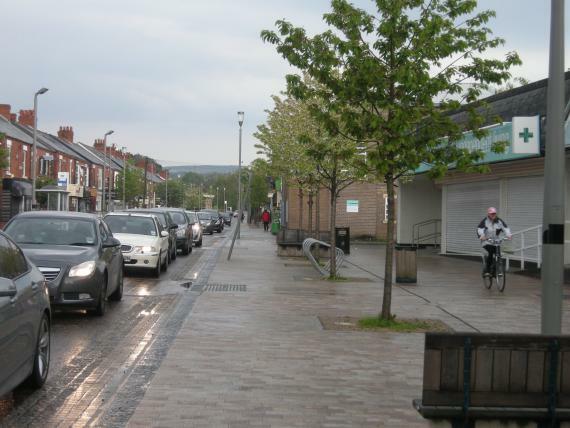 Instead of that idyllic picture of pedestrians meandering on wide sidewalks and cyclists weaving to and fro on empty streets, the finished product will look more like another recent "shared space" mess in Poynton, England that did nothing to reduce car traffic and told cyclists to go screw themselves. I assume there's nice brick under all those cars. Valenzona also received another $10,000 to continue working on his design. "Over the next year, Richard will work closely with Distl and a team of industry mentors to implement his vision and improve one of Toronto’s most famous public ultimately transforming it into a globally recognized street spaces." You can add as much fancy brick as you like but you can't make traffic disappear. And if your solution for cyclists is to force them to sit behind heavy traffic and breath in heavy fumes, in ride in front of angry drivers forced to travel at bike speed, then your solution is actually worse than what we have right now on Yonge. 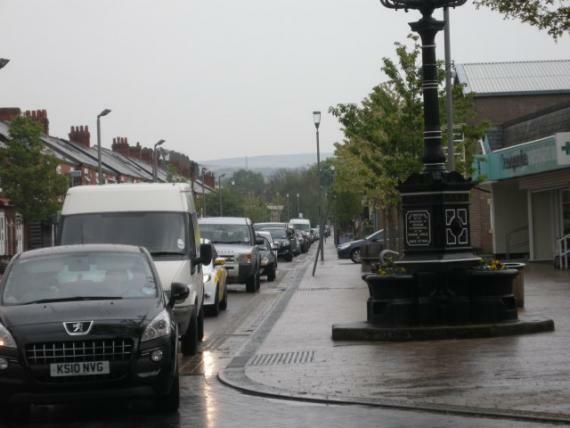 With no space for cyclists, and faced with the only option of sitting in car traffic, cyclists will probably do what this man ends up doing in Poynton: take to the expansive space set aside for pedestrians. 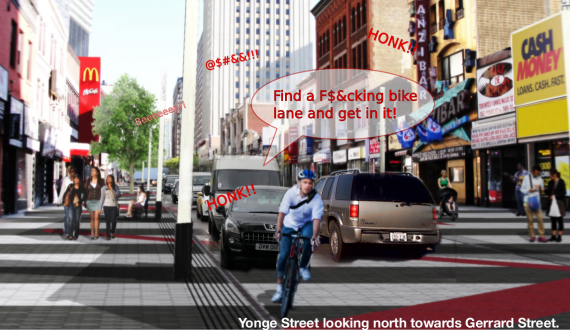 Will Yonge be yet another project like John Street or Front Street where designers decide to ignore all the concerns of cyclists? 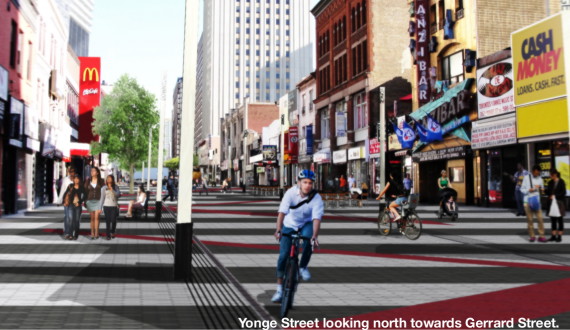 Is this what Toronto will interpret as a "complete street"? I guess we'll find out. Poynton was more about how to deal with a weird pair of intersections, than about redesigning an avenue. I think this proposal has more in common with Rue St Catherine in Montreal. It's a street when it needs to be a street, and a public square when it needs to be a public square. Yes there's traffic, but the design pushes the idea that it isn't just a road for cars. You're damn right there's traffic on Yonge. 20,000+ cars per day! I don't see why we'd want set the bar so low as to compare this to Rue St Catherine. For most of that street, there's nothing special about it. It gets less traffic than Yonge and is one way. Yet the street is still wide enough so that cyclists are not stuck in traffic. But it is also far from being a comfortable street for most people who might consider cycling. Not only does this design not provide any separation for cyclists, it actually makes it worse than the status quo by forcing cyclists to either get stuck behind cars or for cars to get stuck behind cyclists. This proposal might say that's trying to get beyond designing streets just for cars, but then does nothing to try to tackle the traffic volume or give a way for cyclists to avoid heavy traffic. Make Bay Street and Yonge Street both one way vehicular opposite directions. Take one lane of traffic out, put in protected lanes on both streets and increase sidewalk width. Take one of the 3 remaining lanes and make it a transit taxi priority lane. The Yonge Redux proposal ignores cycling and assumes people are comfortable riding bicycles in mixed traffic which of course 90% of the population is not. It's too dangerous until we get separated cycling infrastructure. Brought to you by the same people who are driving cyclists off of John Street. Multi-lane one way streets are only for want-to-be expressways. They are meant for speed, to get from point A to point B fast. They are not meant for shopping, nor for walking, nor for bicyclists. Parking should be prohibited. However, there should be laybys or parking bays off road for deliveries or pickup of goods. Why so categorical? Take Hornby Street, Vancouver. One-way, two lanes for cars, one bidirectional separated bike lane. It's not a highway, it's a downtown street that's used for shopping and travelling through, yet it's comfortable for everyone. Let's not write off one way streets just because we're used to seeing them just in one context. Last time I was in the Netherlands I saw them used all over the place. Parking is prohibited on Yonge and most of Bay. Deliveries should only be legal at night Yonge south of College. Most of Bay has large buildings with loading docks. Yonge street north of college has laneway at rear so deliveries between Bloor and College could be at rear of commercial properties anytime. 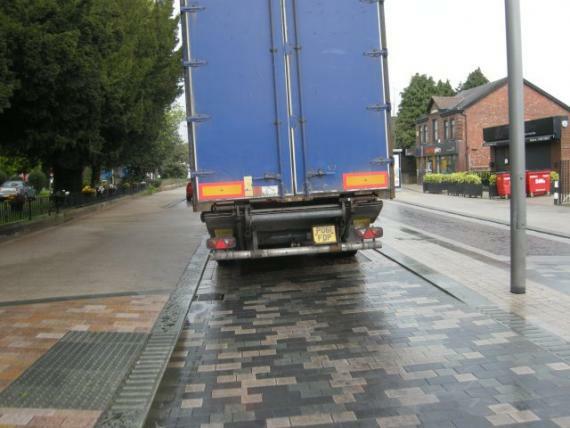 No need for delivery laybys which decreases safety for pedestrians. Two lane vehicular one way is not an expressway. Speed limits could be lowered. Separated protected bicycle lanes and 2 lane one way would increase safety for pedestrians over existing Bay and Yonge 2 way condition. "Over the next year, Richard will work closely with Distl and a team of industry mentors to implement his vision and improve one of Toronto’s most famous public ultimately transforming it into a globally recognized street spaces." THE EFF DOES THIS EVEN MEAN? Grammar...you're doing it wrong. The only change I would make would be to put bike lanes in the centre of a car-free Yonge Street. 185 (2) The council of a municipality may by by-law prohibit pedestrians or the use of motor assisted bicycles, bicycles, wheelchairs or animals on any highway or portion of a highway under its jurisdiction. R.S.O. 1990, c. H.8, s. 185 (2). This is why there's no walking-and-cycling-only roads in Ontario. And it needs to change. I've noticed a lot of architectural renderings omit vehicle traffic. Consider this bizarre example from the TTC's Leslie Barns project, which feature an empty Lakeshore Blvd. This image is featured on their billboards and the façade of their Queen E project office. Perhaps this was a previous version of the HTA that no longer exists? I do know that there are car-free roads in Ontario. They range from Sparks Street in Ottawa to every road on the Toronto Islands. Sorry Kevin, that was part of 195. (1) . I'd love to be wrong. My understanding was that vehicles are "all or nothing". Either 100% pedestrian or totally mixed traffic. I note that it is legitimate to ban cars if the ban is consistent with the rest of the HTA. Which is why there are numerous car-free bicycle roads in Ontario. Including every single road on the Toronto Islands. My speculation is that the purpose of this section of the HTA is to prevent a municipality from putting in such a ban on a provincial highway that passes through a municipality. For example, Mississauga has a fight with the province and tries to ban cars from the QEW. But that's just my guess. What I know for a fact is that there are lots of car-free bicycle roads in Ontario. This is a copy of Times Squares' current layout, but you can't drive cars through it, only across a couple of few streets. I think Valenzona's entry has possibly been inspired by London's multi-million pound shared space project on Exhibition Road, rather than Poynton. In fact, looking at the markings on the floor, it seems he's copied it quite a bit! Unfortunately for Valenzona, Exhibition Road is a complete failure. It's a race-track, looks quite a bit like your edited photo actually! The council no longer refer to it as shared space, but as "single surface" because there are no kerbs. I don't know where Valenzona got his inspiration but gather from the design that it is in the same school of thought as Exhibition Road and Poynton. That school that the As Easy As Riding A Bike blogger brilliantly calls "Placefaking". The architect has the gall to include one car in the entire rendering set. Yeah right. I too, am tired of bikes treated like they don't exist in what's supposed to be progressive new design for streets. To cycle on a street like this one is lousy. You get stuck behind cars in traffic and the drivers get frustrated with you for being in front of them when traffic does move. So let's encourage young talent, but young and old should understand that cars and bikes in single file is a terrible idea. Either provide bike lanes or a lane wide enough to pass cars in traffic while riding near the curb.